Finally, I managed to submit the layout and matching card for Papier Blog Contest. 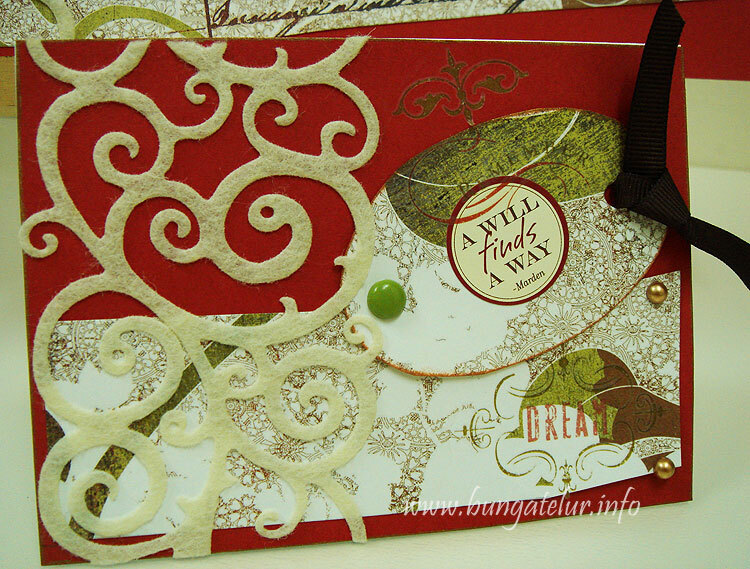 It doesn’t do justice to the scrapbook layout by posting a small picture on this blog, (you can’t see the details clearly – the sentiment, the rub on, embellishment etc) but alas, what can I do..should find another blog template with wider space for entry. I used most of the scrapbook stash I bought pre-baby years, which was like 3-4 years ago. I felt so ancient for using those vintage products – self adhesive felt, patterned paper Scarlet Letter by Basic Grey, K&Co rub on, stickers by 7 Gypsies..haha! The only new things I used for this contest (which were bought recently) are the green brads and self adhesive pearls. When I chose the picture of my son’s feet, my first thought was to write the sentiment ” A journey of a thousand miles begins with a single step”. The picture was taken the first time we brought him to the beach almost a year ago. He has just learned to walk that time, how time flies as now he can run everywhere. But as I struggled to complete the layout, I realized that entering this contest is more like fulfilling my dream and nurturing the passion of craft I have inside. I almost gave up today since I couldn’t find the time to come out with the masterpiece. It’s not easy being a mother to a high-need, spirited kid. Only those in the same shoes will understand. No matter how much enthusiasm I have inside, I wouldn’t be able to realize my dream of entering this contest without the support of my husband. Both of them went out for about 2 hours and left me in the craft room to think hard and come out with this layout peacefully. Just as a mother would be proud and beaming in joy to see her son takes his first step, I am so proud to present you this scrapbook layout. For the matching card, it doesn’t take long to do it as I already have the sketch in my mind after doing the scrapbook layout. This card will be sent to a close friend in Japan who recently lost her beloved mother. She is doing her post graduate study there and couldn’t make it home to her mom’s funeral. I chatted with her a few weeks ago and encouraged her to be strong and do her best to complete her study. I believe each and everyone of us has challenges in life to overcome. A strong will is what we need to find the way out.